There is a regrettable and incorrect implied understanding in evangelicalism that much of what was displayed by Christ of his character during his earthly sojourn was temporary–God operating with one hand tied behind his divine back, so to speak. For example, some preach that Christ was meek and mild in Earthly Sojurn #1, bearing the Cross, turning the other cheek, forgiving his enemies, but that he will be nowhere near so nice in Earthly Sojurn #2, when he comes back to mop the floor with the baddies, break the Cross in half over his leg, and ram both ends down his enemy’s throats. Such poor preaching overlooks the Apostle Paul’s insistence in Colossians 2:15 that in the Crucifixion Christ disarmed his enemies, shamed them, made a public display of them, and triumphed over them. The Cross is plenty powerful enough to bring the present creation to the conclusion God intends, thank you very much. In his return Christ does not bring a better tool to finish off the job; instead, he judges according to our reaction to his first–and only–tool. You can see that Christ is a Man Of One Method in Revelation 5:6, when, acclaimed as the Lion of the Tribe of Judah, he appears before all of heaven as a lamb newly slain. In his return he will make war with the same sword–the sword of his mouth–that he used in his first visitation. In other words, the incarnation is a not a teaser–or a warning, or a scaled back, watered down–of the character of God. It is the full revelation of God. The second coming points back to the first, adding nothing new. 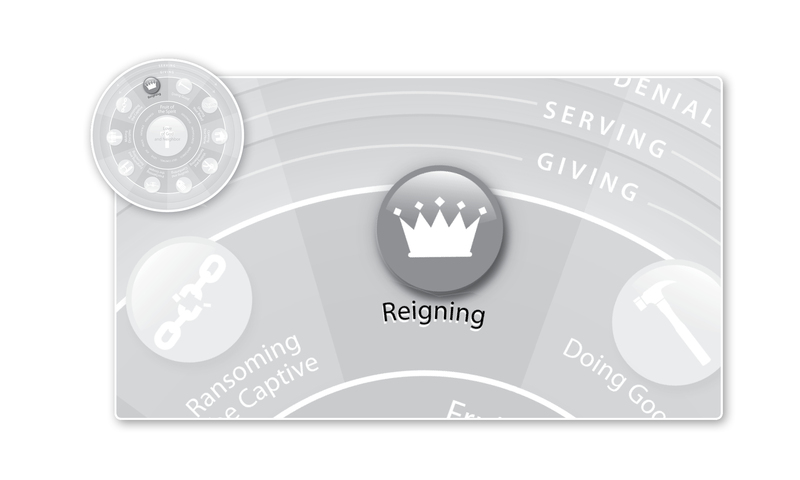 We stand to make this same “two act” mistake in our understanding of leadership and the Work of Mercy of reigning. If we are not careful we will assume (wrongly) that whoever would be great among us must first be the servant of all–until, for example, we learn to be humble and to pick up after ourselves and to be nice to all the little people we meet on the way up. Then, we assume (wrongly), we will be given the leadership mantle, wherein it will be necessary from time to time for us to lord it over people like the Gentiles do, since our subjects/staff/family members/fellow believers need someone to keep them in line, you know, or else the whole thing will get out of control and (heaven forbid) people will begin taking advantage of us. But a careful reading of the Scripture shows that Christ’s service is not a limited time engagement. He does not take on the form of a servant and then give it up when his father exalts him as the name that is above every name. Instead, he reigns eternally as a servant. His character–and his relationship to us–is unchanged. He is still the servant-in-chief. And he always will be. Too little attention has been given to noting that the risen Christ is as much of a servant as the earthly Christ. Recall that it is the risen Christ who serves breakfast, dries every tear, prepares an eternal home for his subjects (he is a carpenter, you know), and bears their persecution in his own body. The sure sign of a counterfeit Christian leader is one who, having been a Christian leader for a long time and having built a good size organization or congregation, reclines (however graciously) into the privileges of leadership and the practices of lording it over his followers like the Gentiles do. The servant king, by contrast, wraps the towel around his waist for all eternity, calling us to do the same if we intend to be his co-regents. This entry was posted in Reigning and tagged counterfeit Christian leader, Reigning, servant king, Work of Mercy. Bookmark the permalink. I always praise God for your encouraging spirit, Pastor Ryan! We will be co-regents, Pastor Foley.